Obama has stepped in it big time, and we have Elizabeth Warren to thank. This collectivist view of our economic system is alien to the vast majority of Americans. It is beyond class warfare, which is the envy of others who are more successful. Obama has attacked success, not just the successful. The anti-success dog will not hunt outside of Massachusetts (and maybe not even there) and a few other states. And now Elizabeth Warren’s collectivist dog is Obama’s dog. Warren said during a campaign stop in Dorchester yesterday, “I think the basic notion is right. Nobody got rich on their own. Nobody. People worked hard, they build a business, God bless, but they moved their goods on roads the rest of us helped build, they hired employees the rest of us helped educate, they plugged into a power grid the rest of us helped build,” she said. Obama has hitched his wagon to an alien ideology touted by a tainted candidate who might be too liberal even for Massachusetts. I don’t think this is going away. It is a theme handed to Romney on a silver platter, a silver platter built, of course, on roads the rest of us paid for. It is a game changer. And we have Elizabeth Warren to thank for it. It’s as if President Obama climbed into a tank, put on his helmet, talked about how his foray into Cambodia was seared in his memory, looked at his watch, misspelled “potato” and pardoned Richard Nixon all in the same day. And via Althouse, Obama is running an ad denying he said what he said and accusing Romney of misquoting him. But of course, Obama did say what he said. This is a sign that the Obama campaign knows how toxic Obama’s embrace of Warren’s argument has become. What’s funny is that the Obama’s truth squad actually thinks his statements are correctable! They are just amateurs..perhaps they should put on their big boy pants. The other night I got a call from an employee telling me that some equipment was malfunctioning. Naive little me, I rushed in and got it working and spent most of yesterday with the repair guy, trying to get it straightened out. From what Obama says, there’s someone else out there whom I should have called, since I’m not the one building my business. Does anyone have that number, please? Can I kinda quote you? Thanks. You built a career based on the Cherokees’ honor? You moved your career to the top on the Trail of Tears the the real Cherokees paid for … in blood and tears. But if private-sector success is enabled by government, guess where that “help” should come from? So, back when North America was mostly wilderness, before there were large-scale governments, there was no business. No general stores, no trading posts, no farm cooperatives — nuthin’. Until people like Barack Obama happened along! For thousands of years, man made his way using trees for lumber, metals for tools, and all the other natural resources Obama made available for his constituents, past and present. I mean … don’t they use streets and the police and all? The problem with the Obama/Warren thinking is that while other people undoubtedly have contributed to my success I have made those same contributions for those who are slackers. So I pay for me by my hard work and the earnings that come with it and I am grateful for those who have like-wise contributed. But I also pay through government confiscation for those who don’t work as hard or at all. In fact they have come to regard it as my duty to provide their wants and desires. Yes, infrastructure and other aid is a constant and can be taken out of the equation. Everybody gets it. On the other hand, tax payers contribute more to infrastructure and government than slackers. 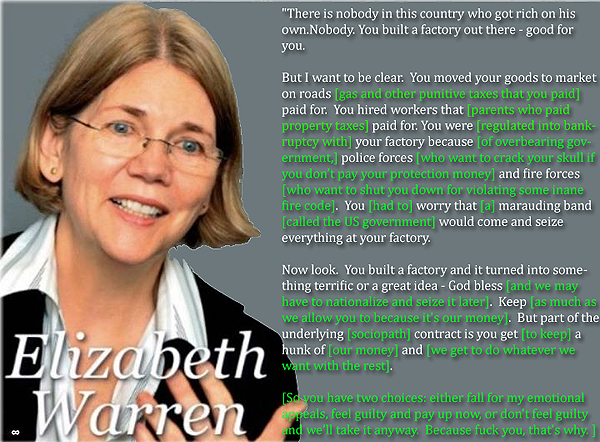 So Obama’s and Warren’s logic fails no matter how you look at it. It’s hard to say that the 49% of households that don’t pay income taxes are helping anybody built anything. In fact, they’re a drag on the whole system. Not 49% of households … 49% of filers. But that is only about 70 million people. another 100 million adults don’t bother filing. pay 90% of income taxes. Cops and teachers might make it in that group, because their government unions coerce excessive pay and pensions … but they get it from taxpayers and by putting government in deep debt, not by producing or being required to be good at their job. Hey, maybe Liz Warren could do a rain dance for him? While USDA Secretary Tom Vilsack said he was praying everyday for rain, he told Obama the drought is not as bad as in the last great drought of 1988. Nope, Elizabeth Warren didn’t come up with this idea. Somebody else did, in fact, make it happen. That somebody else was the Occupy movement. This is their most fundamental idea, that we’re all a collective, that the state is supreme, that there is no individual accomplishment. That’s why Wall Street was their devil, not so much due to the corruption, but because they embodied the marketplace which is the antithesis of what the Occupiers stand for. You would think as a “constitutional scholar”, that Obama would be familiar with the predisposition of American exceptionalism. It is a matter of placing the trees before the forest, while not altogether losing sight of the latter. If you’re a business owner and want to have some fun, go to this blog and see the photos others are posting… add yours if you want to. Business happens today in spite of government. A lot of business doesn’t happen because of government. Look at all the taxi drivers who don’t own their own cabs or who do not become drivers in the first place because of the cost of a medallion, the supply of which is artificially restricted to protect those already in the profession. Only government could maintain that kind of business-killing regulation. Without government intervention, the only way to keep would-be taxi drivers out of the profession is intimidation and violence, and that’s the time when the government should really step in. Law enforcement and the courts. Even if you want government for infrastructure, education and stuff like that, those things should really be done on the state, county and city levels, not the federal level. Okay, I might buy Obama’s argument for reasons why the states and counties should intervene *sparingly*, but not the federal government. And then there’s this old classic from Warren. To think that Obama could lose the election because he followed the lead of a self important elite liberal blowhard white affirmative action minority woman Harvard professor Prius driving mortgage foreclosure profiteering hypocrite is darn funny. I’m midway through Mark Steyn’s After America. His description of Obama is priceless. WEIRD = Western Educated Idle Rich Deadbeat. Many pundits have pontificated that Virginia is a battleground state this time around. The Va. Attourney General ( Cooch for Gov!) has stated in his speeches that whichever way the election goes, Virginia willl be in the winner’s column. I never expected that the words that will win it for Romney were uttered by the president,off teleprompter, last saturday in a tiny firehouse in southside Virginia (in coal country no less). well his people thought it would be a good idea, for appearance’s sake, to try weaning barack off of his teleprompter…and, lo and behold, what appeared was the man behind the mask in all his snide, disdainful glory. oopsie! It certainly wasn’t my hard work, my dedication, my late hours, me not taking a pay check during tight times that was the cause of a modicum of success. Stupid me. It was the government that gave this to me. It wasn’t my tax dollars that paid for the roads that my clients drove on to get to my office. It wasn’t my tax dollars that paid fire fighters to put out someone else’s fire. It wasn’t my tax dollars that paid for the protection of the police. It wasn’t my tax dollars that paid for a Great Military to keep that jackass in MY WHITE HOUSE safe. But what do I know. I need that jackass to keep me successful. If Romney doesn’t keep running with this, he doesn’t deserve to be my President. B.Hussein.Ubama conveniently forgets that PRIVATE companies build the roads, the bridges, the buildings and are funded by taxpayers. The Govt simply is a conduit to steal the money from taxpayers and send it to the private companies who actually do the work. The govt simply does not build anything or produce a product for market. Many people here seem to be missing Warren’s point. She is not saying that succesful people should give everything they earn back, just an extra 3%. However, the entire argument would make much more sense if she was talking about ending subsidies and closing corporate tax loopholes. If businesses are the one’s that are thriving (and they are, as corproate proits are at an all-time high), let them give back for infrastructure imporvements.